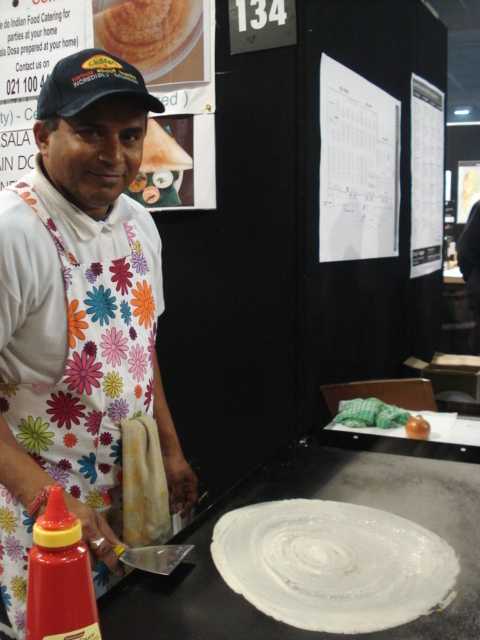 To describe the Auckland Food Show in three words – “Bustling, Colourful & Inspiring”. Never did I think that one of my long forgotten wishes was going to come true. When Ram came home that evening, he had this really smug grin that made me wonder what he was up to! He asked me to open a plain white envelope. I looked at him with narrowed eyes all sorts of things racing through my head. Could it be movie tickets? A pay rise? (Yeah right, we are barely out of recession…duh!!!) Invite? A surprise holiday?…… I wish!!! Ram a holiday in Bali would be nice :). I slit open the envelope with these thoughts playing around in my head. And what do I find? 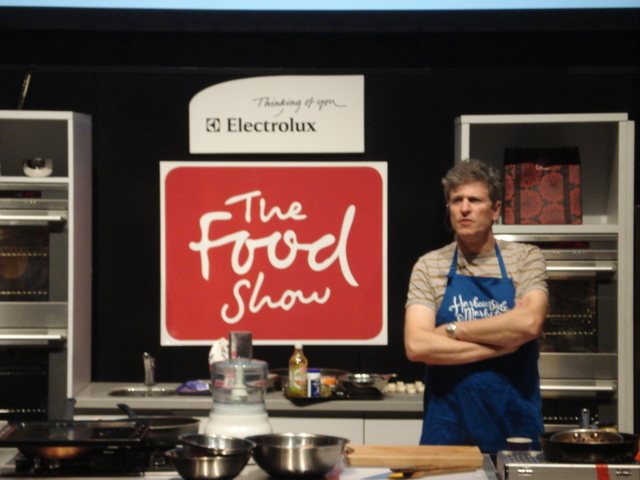 Two tickets to the Auckland Food Show. I was stoked. No words. No reaction. Just a gaping silence from me. My eyes misted and I smiled sheepishly, thanked Ram for surprising me and for remembering such a tiny detail from a long forgotten conversation. So both of us got our very first taste of attending a Food Show in the midst of Food Connoisseurs. We were clueless where to begin. We scanned the hall to find on one end an amphitheatre that was going to host cooking shows by top celebrity chefs from New Zealand and across the world. And the remaining floor area housed stalls in various shapes and sizes of the gazillion retailers offering up their produce for the people to sample and judge. And if they were lucky to win the vote, some spot sales and collection of their business cards for tying bulk deals. I realised that the Food Show is such a wonderful platform for companies to showcase their products and build their public image. Some of the stalls had such enthusiastic sales people inviting people to sample their products that the hawkers in the streets of Mylapore would have had a healthy competition. The stalls boasted a wide range of products and services right from the most divine cheeses to exotic fruit juices, luscious wines, electronic gadgets, delightful chocolates, rustic chutney, organic preserves and many many more items. I am sure one can imagine the scale that I am trying to describe. Humongous! We started around by visiting the first aisle of stalls. An announcement was made that the first cooking show was going to start in a few minutes. Ram and I checked the schedule and made a beeline to the amphitheatre.When we were doing so, we almost bumped into a poor girl standing with a tray of tiny plastic cups carrying samples of different teas. The aroma of the tea assailed us. We tried Ginger Chai, Cardamom chai and my favourite of the lot Masala Chai. I looked at Ram wistfully wanting to buy them. Ram said let’s go for it and we picked up a box of each. They are sweetened and flavoured tea packets sold for instant chai and all we need to do is add water. Worth trying!!! And by the way I checked out the price, it’s $10 a box with 10 sachets in it. A dollar for a mug does seem expensive but not when you have it once a while. We hurriedly paid for the tea and made a move onto the theatre. We went up 7-8 steps and grabbed a couple of seats right in the middle for a good view. We faced a middle-aged live wire on stage who was so vivacious she would have put young people to shame with her boundless energy and smile. She was Annabelle White. Her every sentence was punctuated with wit and humour. Her theme was Comfort Food, Home cooking tips and fun while cooking. She singled out Ram as he was acting cheeky. When she asked the audience to “Hold on tightly to your chairs”, Ram being Ram literally did that. Am sure you can get the drift. So she cornered him and said “you, the man with the baseball cap. Can you please stand up please?”. His neighbour on his left and I poked him in the ribs to stand up. Annabelle said “Because you have been cheeky you need to be punished. 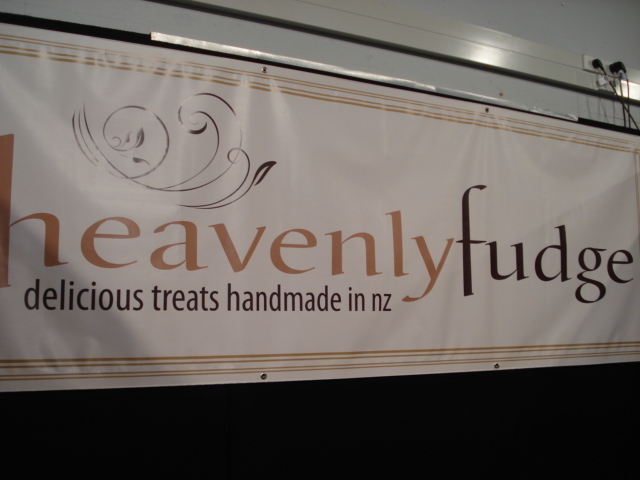 So what chocolate would you like – Feijoa Milk Chocolate or Caramel Chocolate? Am pretty sure you will be picking Feijoa……I mean who can say no to it….”, when Ram interrupted and said “Caramel chocolate”. Annabelle became all animated and sent her assistant flying to us with a pack of mouth melting Caramel chocolates and that’s how Ram was named the “Feijoa Chocolate Man” for the remainder of her show. She shared not just some tips for home cooking, she also shared some of her recipes which I am yet to try, but I am pretty sure will turn out as wonderful as her. I ended up buying her Cakes and Slices book from the book stall eventually that evening. After the show we even managed to talk to her and got treated to a photo opportunity too. We pretty much stayed put for the next two shows as the crowd had just started milling into the Food Show. So it definitely pays to go early for good seats and some fresh perspective. 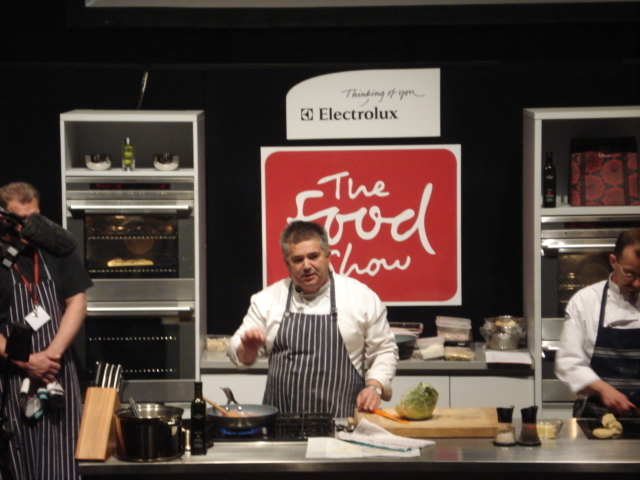 Next on stage was accomplished Jack of All Trades / The Self taught Chef Stefano di Pieri who is based in Mildura, Australia. He was a person who had a nice fading Italian accent, adding just the amount of rustic charm. His love for food was apparent from the way he handled the food. His show focussed on Modern Italian Cooking. He spoke about bread making and demonstrated making a Rosemary Foccaccia. I have always pronounced Foccaccia as ‘fo-k-asia’, but apparently the right Italian way of pronouncing it was ‘Fo-kaa-ch-ya’. He also demonstrated making a Piadina, a traditional Italian flat bread which according to him is something like a Pita bread. Stefano’s show was certainly different, presented on a different level altogether and something I could appreciate because I just love Italian food. Sitting without moving for over 2 hours was a real pain. But well worth it. We finally waited it out for the next show, for the chef who is a common face on New Zealand Televisions these days and Ram’s favourite. The temptation to yell out to Richard, for him to say “Shop smarter NZ” in his overtly enunciated voice was just too much. But I was on my best behaviour. Richard’s theme was method and technique. But I have just 2 words for his show. Sloppy and entertaining. He spoke about browning of onions, cooked a rabbit and made Aioli which was the saving face. I wouldn’t say I was wowed by his presentation, but there is just something about him that keeps you on the tenterhooks. But as an after thought, it’s probably trying to understand his talk and accent which was the challenging part during this particular show. I will hunt down my recipe sheet and share the Aioli recipe shortly. There after we started scouring the numerous stalls sampling items of interest and buying if it was great. Have put the pictures of only brands/products that are worth mentioning. Paneton – A french bakery located in Auckland central. We just happened to pass by their stall. The aroma of warm bread drew us like a moth to a flame. We saw the array of food for sale on display. 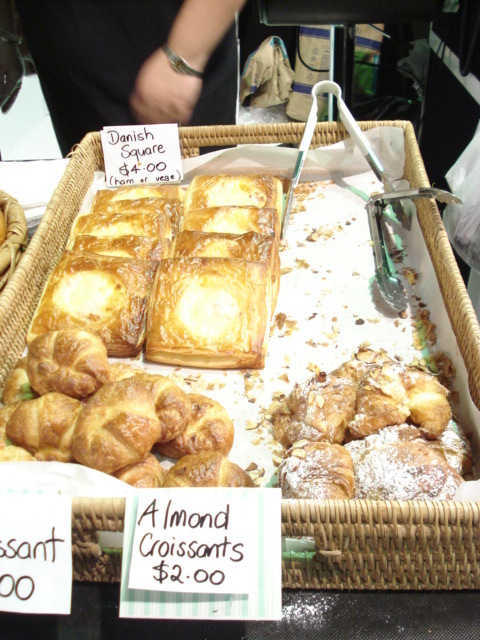 Those Almond croissants that they had made were the best I have ever ever had hands down. So soft and almondy, the medley of smells of melting butter, almond essence and warm baked sweet bread was so mouth-watering and irresistible. I can’t get the softness of the croissant off my head. It was that perfect!!! You will find this jewel at 21 Halsey Street in Auckland opposite to Victoria Park. Nuttz – As the name goes, nuts in such a variety of flavours. The show stealer was their Moroccan Tagine cashews. Also good was the Chilli and Lime cashews. Packed with flavour and quite addictive I must say. 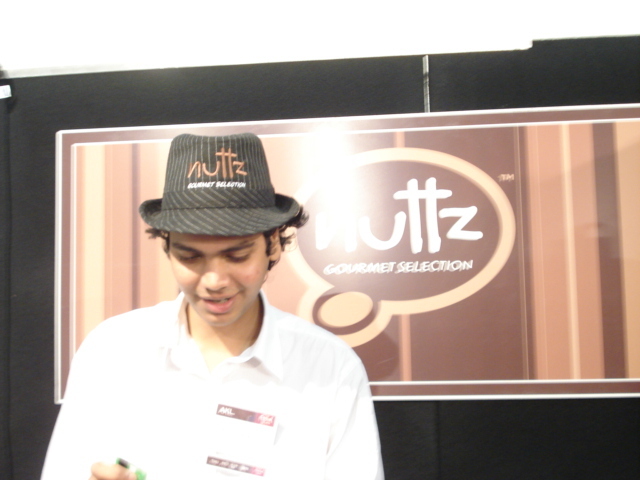 This sales representative for Nuttz, was quite enthusiastic, even tried on some of his linguistic skills on us. Bubbly and energetic living up to the brand name he represented. 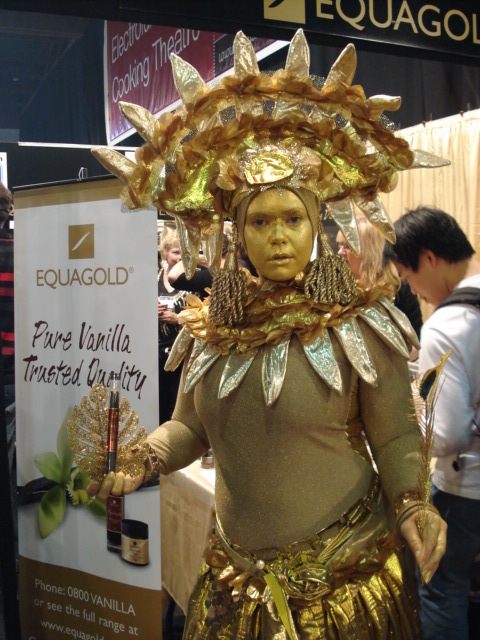 Equagold Vanilla Woman – Suddenly in the milling crowd, I came across this golden statue or that’s what I thought. I gaze at the golden spectacle with open curiosity, the head-gear dazzling me and suddenly I get a wink.and that’s when I realised it’s a human statue. I immediately had to get a picture of the golden human statue. Butterscotch is the flavour. Mouth melting. Worthy of finger licking. Delicious!! Need I say more. Gorgeous!!! While all we were getting were tasty nibbles and small samples, we were hungry for a good bite of food especially since we missed breakfast to accommodate all that tasty samples. And wonder of wonders, in the middle of the rows and rows of stalls, the smell of masala dosai filled the air. Our noses followed the aroma of the dosai and saw fresh hot dosais being made. And paired with Mysore style sambar and coconut chutney, it was the perfect lunch that afternoon. After buying some Sun dried tomatoes and Greek Olives and booking a snazzy Kenwood Food Processor, we returned home with a full stomach and our minds filled with images of food and foodies memories!! !